I love this icon. I love the passage it depicts. I love it because I can so strongly identify with the fear and doubt that Peter is feeling. 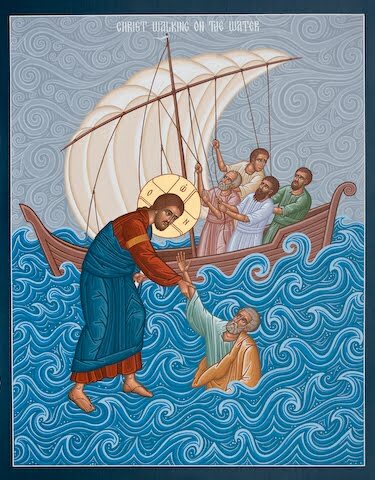 Even the disciples in the boat are exhibiting some of that same fear—some of them may be looking at Peter in concern, but for the most part they seem focused on and worried about their sails. 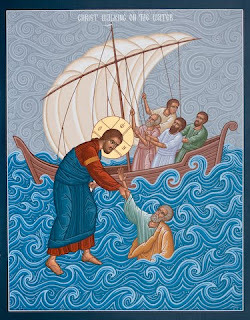 Only Peter is really looking at Jesus, and we can see from the text that it was in his seeing the wind—looking away from Jesus—that he began to sink. I'm reminded that I blogged about this passage once, in part as a response to controversy that erupted over the release of the film The Golden Compass. Parents feared their children would see the movie and doubt their faith, which would naturally lead to an endless spiral into the murky depths of sin and godlessness. But I read that book when I was a kid—I read everything of Philip Pullman's—and I'm in seminary. So there's that. What reminded me of that old blog post was the quote I used to start it off. It's from Frederick Buechner, a hero of mine, and it's something that has remained with me and which I find comforting in times of doubt. Buechner says, "Without somehow destroying me in the process, how could God reveal himself in a way that would leave no room for doubt? If there were no room for doubt, there would be no room for me." God knows us better than we know ourselves, and that means he knows just how prone we are to falter and to lose focus—to look at the wind rather than at Jesus. God isn't so naïve as to think that once we come to faith we will be able to rid ourselves of all doubt and fear. He makes room for us. "Christ did not descend from the cross except into the grave. And why not otherwise? Wouldn't it have put fine comical expressions on the faces of the scribes and the chief priests and the soldiers if at that moment He had come down in power and glory? Why didn't He do it? Why hasn't He done it at any one of a thousand good times between then and now? And so, I thought, He must forbear to reveal His power and glory by presenting Himself as Himself, and must be present only in the ordinary miracle of the existence of His creatures. Those who wish to see Him must see Him in the poor, the hungry, the hurt, the wordless creatures, the groaning and travailing beautiful world." Faith is necessary because if God is to be a God of love, the worship of him can never be forced. I'm apparently on a quote kick—here’s another one I recalled: "He who remains good simply because he must serves necessity, not God." That's from John M. Patrick. We are called to serve and love God, and God will not secure our loyalty through uncaringly enslaving us. I love the passage about Peter walking on water because it shows that although our doubt is not exactly pleasing to God, he doesn't give us over to it, either. Jesus rebukes Peter, but he doesn't leave him to drown. The question Jesus asks—"Why did you doubt? "—sounds rhetorical, but I wonder if that wouldn't be a helpful question to ask ourselves in times where we are floundering in water on which we once walked. "Why did you doubt?" "Because I was afraid." "Why were you afraid?" "Because I saw the wind and it frightened me." "What did you have to stop looking at in order even to see the wind?" "You, my Lord." Peter has the faith necessary. He had already taken a few steps across the sea before he sank. Having faith and having doubt are not mutually exclusive. Perhaps my favorite Bible verse is Mark 9:24—"I believe; help my unbelief!" The profession of faith is separated from the confession of doubt by nothing more than a semicolon. Jesus treats our doubt with a gentle rebuke and an honest question. I do not treat my own doubts and fears so gently. I often find myself in situations where it is almost as if I were willing myself to drown as punishment for even looking at the wind in the first place. But the doubt is a part of my humanity, and it is not up to me to decide how long I must thrash about in the waves. The band Caedmon's Call sings, "Waters rose as my doubts reigned / My sandcastle faith it slipped away / I found myself standing on your grace / It had been there all the time." Jesus' hand is outstretched. "On Christ the solid rock I stand / All other ground is sinking sand."